Our new lift hinge-gravity self closing type can close the door automatically by its weight. So you don’t need to worry about that you may forget to close the door. The bushes are made from resin, so generation of metal dust can be suppressed. The hinge piece is made from stainless. 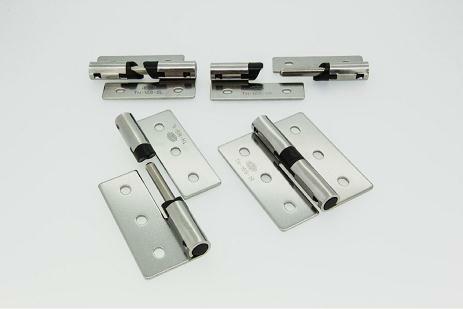 This hinge is compatible for installation with TH-63(TH-169-1) and TH-61-3(TH-169-2). You can check the specification of this hinge from the PDF catalog(PDF file).